Posh-git is a set of PowerShell scripts which provide Git integration. This post describes how to install posh-git on Windows 10 Enterprise without any proxy. 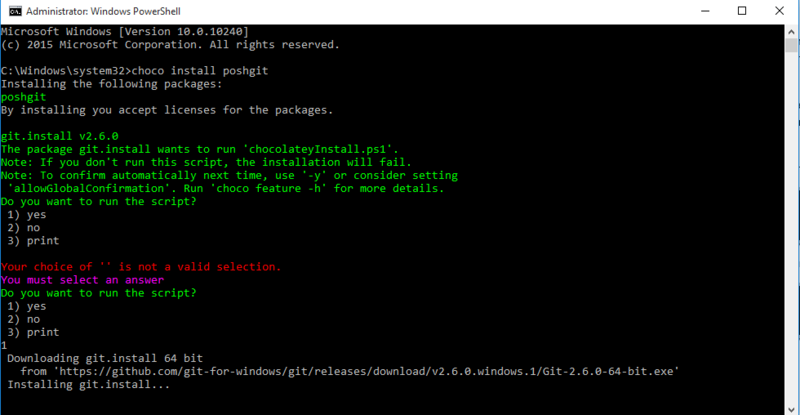 After restart run ‘choco install poshgit’ command. During installation on Windows 10 PowerShell acted like it was freezed so don’t hesitate to use enter key in order to see the progress. After PowerShell restart this error should disappear. However there is one more step to complete for posh-git to work correctly. As for day of this post creation there’s known error in Microsoft.PowerShell_profile.ps1 which causes posh-git not fully functional, so this file content should be updated. Microsoft.PowerShell_profile.ps1 file is placed in C:\Users\your_user_name\Documents\WindowsPowerShell folder. Save file and then restart PowerShell – happy work with Git using PowerShell. MVA is a great place to learn at own pace. Many of trainings are published then on Channel9 (http://channel9.msdn.com), but some of them aren’t (and vice versa). There is a huge number of trainings available now and everyday it’s increasing. Many of them are also recordings from live events, so if you can’t participate, you can always watch them whenever you want. As already mentioned before, many trainings are available on Channel9, however there’s something special what makes learning using MVA different and attractive. In order to finish given course you need to finish all the modules in it and each module has a ‚prove your knowledge’ part in which some questions needs to be answered based on watched material. Having such a perspective when watching videos, requires more focus during them in order to complete given quiz. If you’re a fan of gamification then you can probably also find scores and achievements functionality quite relevant. That’s not in my case, however what I like the most (apart from great trainings) is a video platform which is able to remember where you left off. Add to this possibility to personalize your training plan and we’re good to go (no more hundreds and thousands of bookmarks in the browser). One disadvantage I’ve noticed so far is the search. Really I can’t find anything using the search box, in fact it’s sometimes easier for me to search a training, which I know name (or part of it), using google (btw the same is true for Channel9 search – at least in my opinion). Disclaimer: Please note that this description is made based on taken notes during installation and is a subject to change after additional verification. Described installation has been made on Ubuntu 14.04. When going through angular.js tutorial I’ve faced issue when running end-to-end tests with protractor. When you run PowerShell script using Task Scheduler remember to place „exit 4” at the end of script (without quotation marks). This code means that script has run successfully. I’ve had never before problems when using Sublime Text 2 (ST2) on my Windows 7 machine. Especially concerning my favorite feature which automatically opens files opened during last session. However I’ve faced such a problem on Ubuntu. Despite hot_exit and remember_open_files properties set to true, no files from last session had been opened. Some people even raised this as a bug (googled for it). …and it works now as designed. After closing editor and opening it once again all files opened during last session are restored. Please note capital L after version parameter with colon. This L is used to mark that search should be performed for label with specified name after it.